I just can't get enough of this weather. Today was 80 and we are supposed to have one more warm day tomorrow before the temp drops and we go back to reality. With it feeling so summery I decided to make one of my favorite summer recipes. These wraps are simple and fast to prepare. A perfect weeknight meal. Season chicken with salt and pepper and grill for 6-7 minutes per side or until juices run clear. Cut chicken into slices. 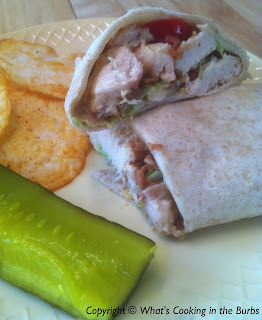 To assemble wraps-Add chicken to tortilla, add 2 tbsp. honey mustard, one slice of swiss cheese, 2 slices bacon, tomato and lettuce. Fold tightly and slice in half. Repeat with remaining tortillas. Enjoy! I love anything with Honey Mustard. This looks so yummy! This looks great! I found your blog at the Naptime Review! Looking forward to trying some of your recipes! Thanks so much, Michelle! I hope you enjoy them! Hi Bridget - found you through Family Food & Travel's 4/30 linky party. These sound delicious and perfect for a lighter dinner! Thanks Sherry! Glad you stopped by!